Happy Valentine’s Day everyone! 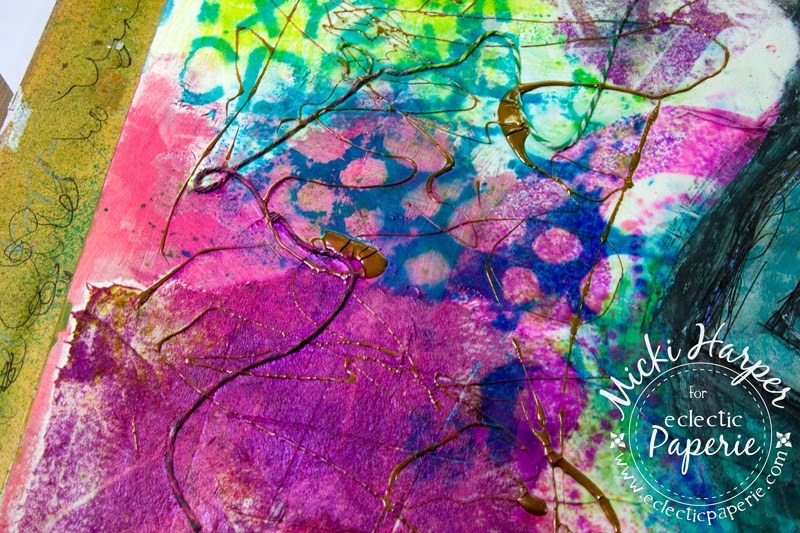 Micki here to share another art journal adventure. I love white space – on cards, layouts, etc. but maybe because of all that cold, white stuff sitting on the ground (snow), I’ve been craving color. Lots of bright color! I’ll be honest and tell you that I had absolutely no clue about a theme or what the end result should be, I just had three goals, finish previously unfinished pages, use the new Studio 490 stencils and like I said earlier…. it had to be colorful. I had glued lots of left over gelli plate prints, regular copy paper onto which I had cleaned a stencil, pieces of paper towel, bits of twine and some -almost dried out- Distress Crackle paint. I even glued a die cut leaf onto the page. Basically anytime I needed to clean my brush or stencil or had odds and ends left over, it went onto this page. Ok, I knew I wanted color, so I started by adding a light wash of Gesso followed by Distress Paints. Because I had used a pen to doodle around the stencil, the paints did not cover it completely at which point I decided to cover that side with Tissue Wrap, followed by adding blocks of color using Distress Paints. Because of the paper towel pieces, the paints seemed kind of dull (those paper towels just sucked all the paints in) so I started adding Dylusions Ink Sprays. I love the vibrancy I got with all those layers, first the paints, then the ink sprays and finally the stains. Next I created a border with Wendy Vecchi Studio 490 Sunburst stencil. I used Black Soot Distress Ink but wanted it to be a little bolder, so I went back over each of the sunbursts with Black Soot Distress Paint. Next I stamped Dina Wakley’s Grungy Silhouette onto tissue paper and glued it to the page. I used Distress Markers to try to define her a little more and for some definition. I also stamped the Script Heart cling mount stamp onto old book paper, and glued onto the page to cover some pen marks and because it's Valentine's. Using a white Sharpie, I outlined all the stenciled sunrays. I don’t know what I was thinking but I ended up smearing the lower right hand corner and was almost frantic (you know, deadline looming). But I was able to “clean it up” a bit, just by using the black Distress Marker. I also used Studio 490 White Embossing Paste mixed with some Barn Door Distress Paint to stencil the flower from Wendy Vecchi Studio 490 Vintage Floral Stencil. I had a heck of a time to get a good impression of the stencil because of all the strings and texture. Well, I did meet the three goals I gave myself. It’s colorful, I used a previously unfinished page and I used two of Wendy Vecchi Studio 490 stencils. I’m glad I pushed on and finished it. This art journal spread was definitely a very colorful experiment! Hope I inspired you to grab those inks, stains and paints and create some color this snowy weekend! LOVE seeing where you started and what you ended up with! LOVE the bright colors and the image! The starbursts define the pages so well! FAB "experiment" pages, Micki! It never ceases to amaze me on the steps your creations take!! I love the colors and stencils!! Seriously a happy experiment!! love. Micki you know how much I adore the way you create and this is gorrrgeous my friend!! I wish I stayed closer so I could come and play.